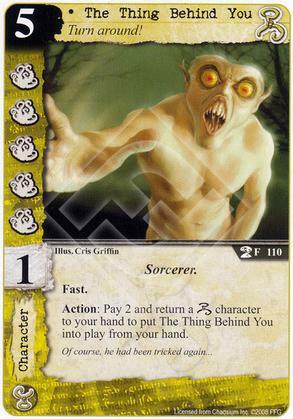 Action: Pay 2 and return a [Hastur] character to your hand to put The Thing Behind You into play from your hand. 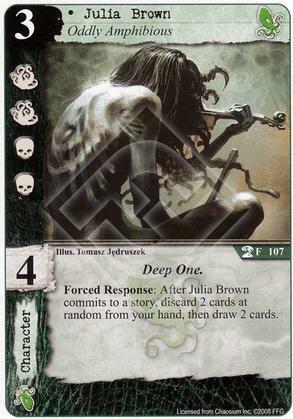 Forced Response: After Julia Brown commits to a story, discard 2 cards at random from your hand, then draw 2 cards. 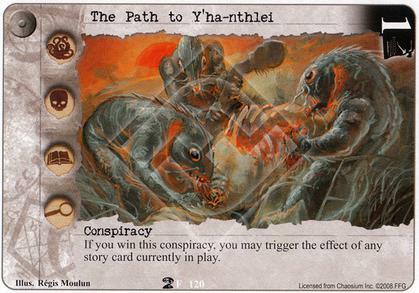 If you win this conspiracy, you may trigger the effect of any story card currently in play. 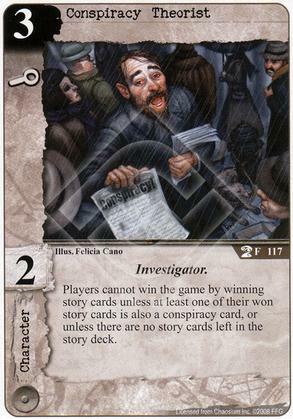 Players cannot win the game by winning story cards unless at least one of their won story cards is also a conspiracy card, or unless there are no story cards left in the story deck. Action: Choose an insane character and a ready character controlled by the same player. The ready character goes insane, if able. 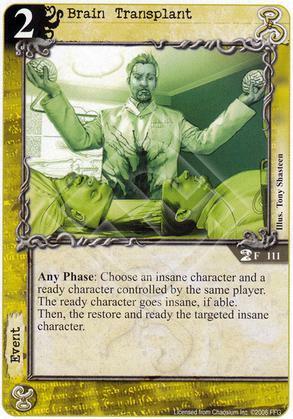 Then, restore and ready the targeted insane character. Characters cannot commit to stories alone. No Comments have been made. Attach to a character you control. 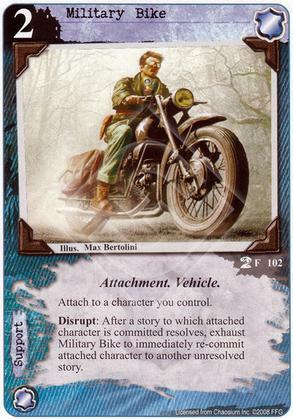 Disrupt: After a story to which attached character is committed resolves, exhaust Military Bike to immediately re-commit attached character to another unresolved story. 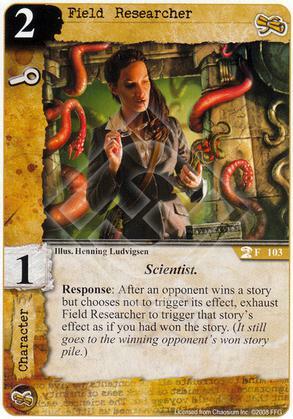 While Confident Rookie has a Weapon card attached, it gains C and Willpower. 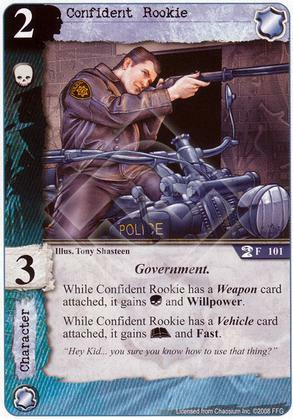 While Confident Rookie has a Vehicle card attached, it gains A and Fast. "Hey Kid...you sure you know how to use that thing?" 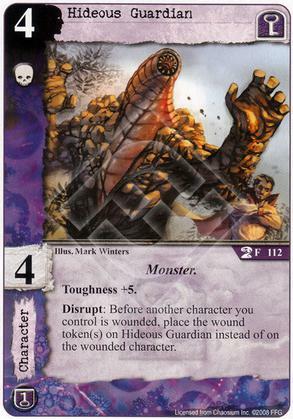 Disrupt: Before another character you control is wounded, place the wound token(s) on Hideous Guardian instead of on the wounded character. If Expendable Muscle would be wounded or go insane, instead attach it to a character you control. 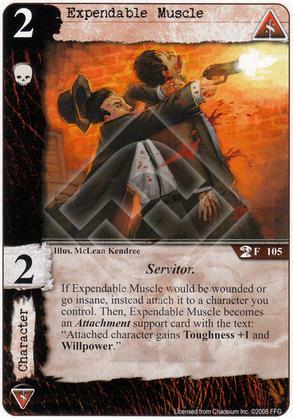 Then, Expendable Muscle becomes an Attachment support card with the text: "Attached character gains Toughness +1 and Willpower." 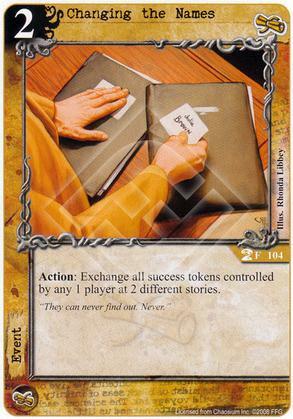 Action: Exchange all success tokens controlled by any 1 player at 2 different stories. They can never find out. Never. 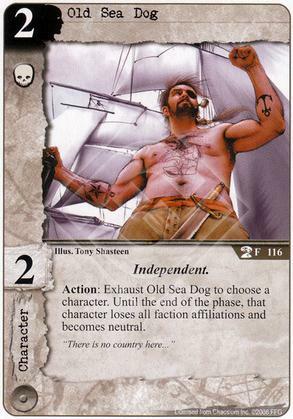 Action: Exhaust Old Sea Dog to choose a character. Until the end of the phase, that character loses all faction affiliations and becomes neutral. "There is no country here..."
Action: Choose every character in play with printed skill 3 or lower. 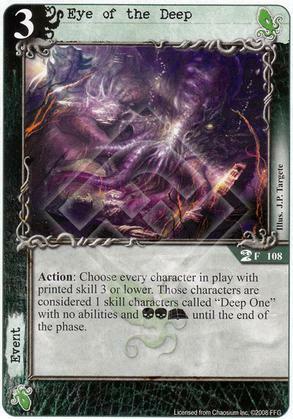 Those characters are considered 1 skill characters called "Deep One" with no abilities and (C)(C)(A) until the end of the phase. 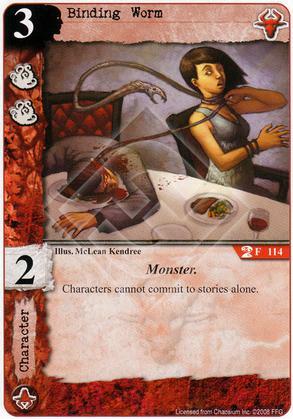 Attach to a character or support card. 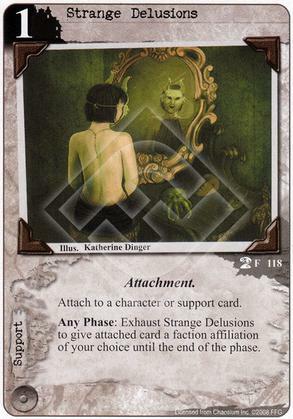 Action: Exhaust Strange Delusions to give attached card a faction affiliation of your choice until the end of the phase. 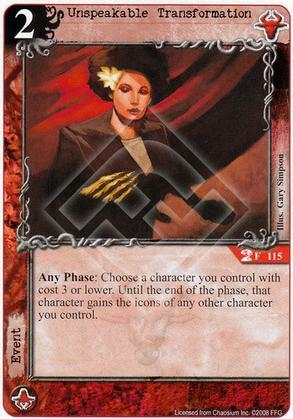 Any Phase: Exhaust Scalethorn Asylum and pay 1 to choose a character. 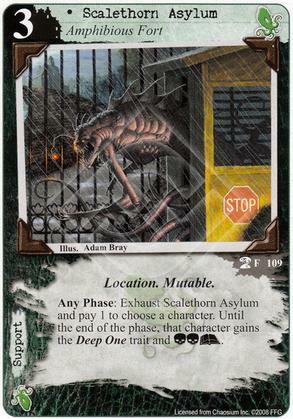 Until the end of the phase, that character gains the Deep One subtype and (C)(C)(A). 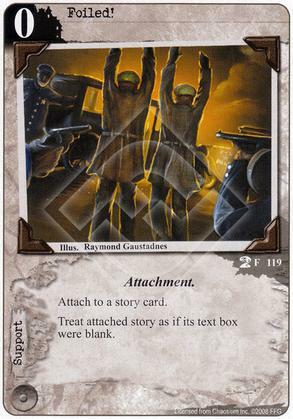 Attach to a story card. Treat attached story as if its text box were blank. 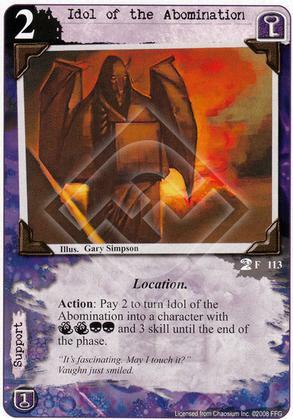 Action: Pay 2 to turn Idol of the Abomination into a character with (T)(T)(C)(C) and 3 skill until the end of the phase. "It's fascinating. May I touch it ?" Vaughn just smiled. Action: Choose a character you control with cost 3 or lower. Until the end of the phase, that character gains the icons of any other character you control. Attach to a character. 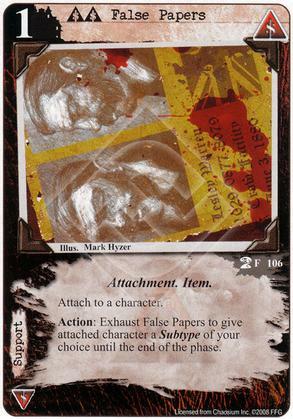 Action: Exhaust False Papers to give attached character a Subtype of your choice until the end of the phase. Call of Cthulhu: The Card Game, Living Card Game, the Living Card Game logo, Fantasy Flight Games, and the FFG logo are trademarks of Fantasy Flight Publishing, Inc.